If you were expecting to be reading last Sunday's results and report, I'm afraid that you are in for a disappointment. There are many activities where two people is the ideal number, sadly model yacht racing really isn't one of them. The turnout at this time of the year is usually well down on average , with many of us taking advantage of the holiday deals after the school holidays and opting for a vacation/staycation while there is still a hint of decent weather about, so it was little surprise that the attendance was so low. Sadly only Mike Kemp and guest skipper, Dave Alston turned up so no formal racing took part but Mike did say that they had a very enjoyable morning chasing each other round the pond and having some very useful boat tuning time. Hopefully numbers will return to normal when all our jolly holiday makers are back ( me included ). Today we saw 7 IOM skippers out to play. The wind was westerly so we sailed from the Spit and used an up and down the lake course but using one of the perimeter marks to force a good beat to windward. We used a relatively short course so sailed two triangles and a final sausage down to the buoy in the easterly bay. A good course which was a challenge (well for most of us, see later!) and allowed places to change depending on decisions, good racing. Whilst most of us had interesting moments a certain Mr Howell blew us away with 8 wins out of 9 races with the other position being a second. So he discarded a first and second place to score just 7 points. At times he was challenged but mostly he was streets ahead, well done John. KC was his usual consistent self (not good enough) and managed to pip Mike Kemp by one point. Mike’s cause was not helped when he became entangled on a buoy and was a DNF. He was rescued by Mike Ewart and his rescue boat. Mike E tried a gentle approach but in the end full throttle was applied and off came number 37, phew!! So lots of fun, good company and good racing. 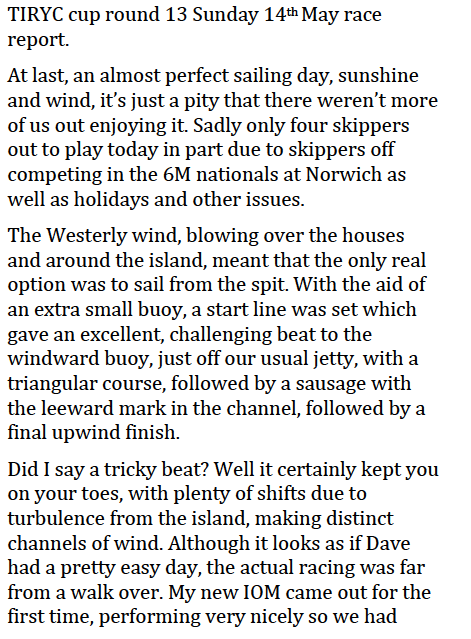 A select band of four skippers today with at least four or five away racing elsewhere or on holiday or in Richard Dolman's case "between boats" (new one being fitted out). Nevertheless it was a perfect sailing day with the wind starting NNW moving to NNE but basically straight down the lake with no island interference. It will be good to see the bigger fleets return once holidays are out of the way? All for now. What could be better - even the course I suggested was accepted with only minor tweaks! “Having returned home to watch the Silverstone F1 GP I found it to be as exciting and close a competition as our IOM competition this morning! As can be seen from the score sheet the top three positions were separated by just one point. Dave Green having discarded two third places scored 18 points with both John Howell and Keith Coxon on 19 points after discards. How close is that. John came in second on count back with more first places than Keith. Six boats arrived for the morning racing with quite a few absent for various reasons. Keith Coxon returned with his IOM to be sailed for th first time since October last year and Bob Tottey one of our newer members arrived with a BritPop, great to see him there. We sailed from the spit with a SW wind giving us a reasonable beat although the wind did move around. We managed nine races with a bit of an interlude when Mike Kemp snagged a buoy and Keith tying to help then snagged Mike's boat. After much faffing around (nautical term) we eventually separated to carry on. Dave Green was in his usual form with five wins out of nine races, Keith managed three with Mike Kemp taking the other win. Dave won the day with 9 points followed by Keith with 12 and Mike K with 16. A Busy few weeks - sorry about the delay! Pleasantly warm and quite windy with one race where just everyone was blown flat or lost control, but with some lulls and unpredictable gusts and wind changes. The two Mikes battled it out between them - and only 4 points between the rest of the skippers gave some close racing at times and everyone had some of the lead action. Beautiful warm day but with a deep cutting chill when in the wind - which was to say it was very variable. A course was set from the spit and 6 skippers engaged in friendly battle with Mike and Dave generally in the lead - but everyone got a spot of front running. Tomas retired with servo trouble but not until after Tomas, myself and Mike S managed to get some disgarded fishing line around us at the start of a race, with Tomas being compensated with a rather fancy ground bait 'bomb. Possibly the most pleasant weather we have seen for some time but the winds were challenging, often disappearing to calm and certainly playing tricks on the starting line and around the marks. Mike Stevens set the course and apart for an adjustment to the angle of the starting line the daisy petal course remained with a long beat out to a far mark before returning to the bay and a number of ellipses around marks which almost made a number of petals, No squares sausages or the usual shapes - but made for a good challenge and everyone seemed happy. A little more wind this week, but not much, and colder. Nice to see Chris Graves after quite a while who, judging from the length of his trousers (shorts), managed to slip out before his mother could check his apparel. Allen Pearce came and sailed his Dragon Flite for a few races, although this is not reflected in the scores, not that it would have affected anything. He felt the cold earlier than the rest of us and left early, but unlike last week did not need the assistance of the rescue boat. John Howell headed the results this week with a near perfect result as you can see from the scores. We arrived Sunday morning to find that at last the lake was free of ice to the extent that we could sail, only the bay to the left of the landing stages having any ice remaining. John Howell was dragooned into setting the course, which was not easy with a light fickle wind. He managed his task well, it had a couple of short legs to start, that were interesting as the fleet was not separated at the first two marks, with a tricky upwind leg back to a mark left of the landing stage. Most people coped with the first and second marks well, I heard little shouting and there was only one pile up when someone turned right not left and took out several boats, I did not complain as I was well behind and thus avoided the three boats tangled at the lake’s edge. Dave Green showed his mastery of the conditions with John Howell not far behind just in front of Mike Kemp. Later in the morning Allen Pearce developed a problem with his rudder, Mike Stevens attempted to push him back only for the two boats to become tangled and finally drift on to the left island. They had to use the dingy to rescue both boats. For the benefit of those who could not attend it was a less cold day than of late but with little or no wind. Only five races possible, they took so long with Dave Green showing a masterly command of the conditions. The rest of us followed behind, in my case often a long way behind. To illustrate the conditions I can never remember a start being cancelled because none of us moved between the start and end of the countdown. Good to see Alan Pearce again, he stopped off on a bike ride. A beat up-towards the Island away from the spit and back into the smaller bay and through the start line before a sausage around the original windward mark and back into the channel before a final beat to the finish. Dave won every race (well his boat did anyway) with remarkable consistency and even when a collision for which he quickly admitted fault did a turn and ended up 4 places from the front was recovered within the run to the next buoy proving skill wins. Keith C had arrived boatless to say Hi and looking very fit borrowed Daves boat - racing on his feet for the first time and won - so perhaps it is the boat afterall? Chris retired with rigging issues and my own boat retired after a catastrophic mast failure from which on examination looks like metal fatigue! - so time for a complete new A rig!! 6 Skippers all with A rig set off on the agreed course amongst a strong on shore wind with gusts and changes. After 3 round Chris retired with a broken rig and 3 of the others went to change to a B. It made little difference with both rigs making similar progress overall.